Another section of the site revamped, this time the Renaissance section gets a nice bump. New Rapier swords by CAS Hanwei as well as some beautiful new models from Marto as well as a nice assortment of Gauches/stilettos (daggers) and accessories. 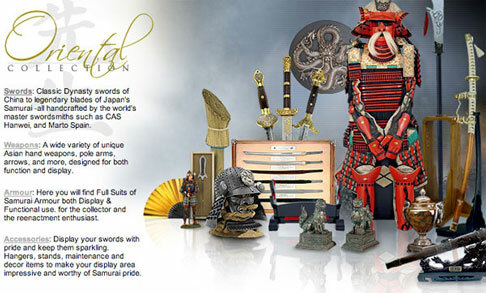 AC0400 Emperor Charlemagne Sword Limited Edition and AC0500 Kamakura Katana Limited Edition are now available. These beautiful limited edition "Antiques Civilizaciones - Heroes & Arms" Martos are strictly limited to 1500 units worldwide, so get one while you can. 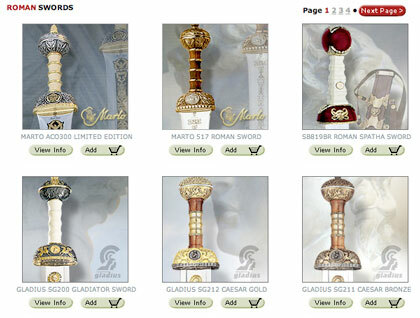 Also available from the "Antiques Civilizaciones - Heroes & Arms" line are AC0300 Julius Caesar Limited Edition and the AC0100 Sword of King Solomon Limited Edition. We have finished out the 2010 additions to our ROMAN category "Roman Classics". Roman Sword, Pugios, Replica Armour, Weapons, and plenty of Roman accessories and decor items to supply Legions! Everything from LARP class props to beautiful home decor pieces now available. RARE and Highly Collectible! 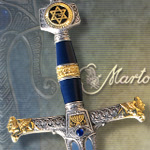 Marto has made only 1500 of these unique and exquisitely crafted swords. Get yours while they last: ROMAN LE, SOLOMON LE, ...more models to come. NobleWares is an official dealer of Master Replica Licensed Products. 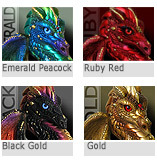 Windstone Editions have introduced some new dragon colors certain to enchant and inspire! Check them out! Many of the licensed "Lord of the Rings" collectibles are becoming increasingly rare and are no longer in production. We are happy to inform you that we have many of the Rare Editions still in our inventory along with the recently re-licensed popular models resurrected by United Cutlery. Extremely Rare Licensed Limited Editions such as the much sought after Shards of Narsil, and the LE Ring and Finger of Sauron, Ring & Gauntlet of Sauron, Museum Collection Sting, Gauntlet of Dark Lord Sauron, and more. Quantities are extremely limited on these items so once they are gone they are gone. Be sure to finish off your LOTR sword collections while you still can! Of course ALL of our Lord of the Ring swords and merchandise are the officially licensed high quality collectibles. - Beware of cheap counterfeits! We are happy to announce our official dealership status with M. Pe ña and her Windstone sculpted creations. From mythical dragons and gargoyles, to luring mermaids and wolf councils, Peña's finely detailed sculpted work captures the imagination and brings beauty and intrigue to any environment in which they are placed. Be sure to explore this unique and growing collection currently being added to our "Decor and Collectibles" section. 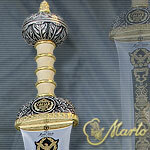 We are proud to announce our continued relationship with MARTO PRODUCTS line of swords and collectibles. For the serious collector, MARTO has been the earmark of quality for many years, and their reputation is even stronger today. We are very happy to have the opportunity to bring the highest quality display swords in today's market to our customers. Quality and beauty are the standards that perpetuates the love of collecting and displaying swords - and THAT is exactly what iLoveSwords.com is all about! 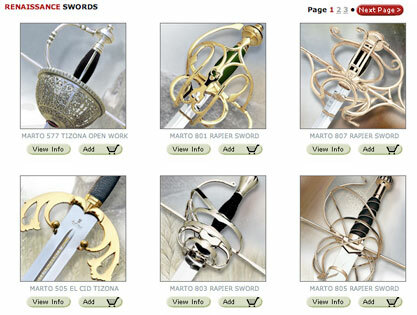 Swords by Marto: The most popular sword maker in the world. Arguably the best decorative sword maker to date. Marto was founded in 1961 in the old district of Toledo Spain. Their mission is to regain the testimony and the techniques of the master craftsman. Today Marto brings back to life the original art of the sword from the rapier and foil to the Japanese katana. Joining traditional hand crafts with modern materials, are a team of men willing to make a daily effort to achieve the unsurpassed quality which Marto is identified with worldwide. All original Marto molds are given the utmost attention so that no detail is neglected. The hilts are shaped from the original piece and are hand finished and polished. The blades are crafted from the finest 420 stainless steel and are fully tempered to 48-53 Rockwell hardness. Marto is also a skilled maker of Suits of Armor, Shields, & Small Collectibles (Martespa).